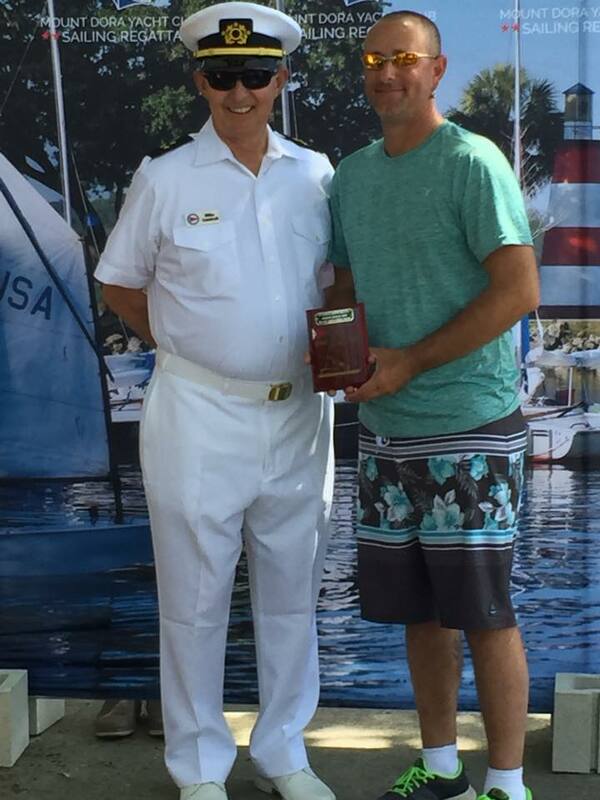 The four boat RS Aero contingent that sailed the 66th Annual Mt Dora Yacht Club Regatta was treated to a beautiful Lake Dora setting, incredibly warm and gracious hospitality by the hosts, and excellent race management. The area has many connected lakes and a plethora of activity of all kinds to include squadrons of amphibious aircraft, fleets of classic mahogany racing powerboats, legions of modern powerboats, and a wide array of sailboats, all treated to the frequent sounds of the whistle of the antique steam railroad that runs the lake perimeter. Sailors were happy to have the Blue skies that were accompanied by very light and light winds that occasionally ranged to moderate but the competitive sailing was not diminished by the conditions. With three courses set up on the lake the Aeros sailed the A Course with the Hobie Waves and Flying Scots. Saturday's conditions were generally light and very light permitting only two triangle course races to be run. Race 1 had a reasonable breeze with your writer finishing in first followed by Anthony Corkell, Darryl Rains, and Donald van Schuppen who was back in his RS Aero after a year's layoff. Race 2 stated in a modest breeze that began to fade and a mark rounding conundrum that involved yours truly and Anthony Corkell arriving at the leeward mark with minimal wind and speed only to encounter a boat wake series that stopped our boats. Donald van Schuppen who had seen marked improvement in his boat speed by moving well forward sought to slide in between but was also stopped by the same wake. With the three of us now going nowhere Darryl Rains avoided the debacle, rounded the mark and trucked away to take a first to finish, boy did that set the hook for him to race! He was followed by your writer, Don, then Tony. With the wind at nearly zero the day's racing was called. An elated Darryl later commented, "I was so stunned it happened it didn't even sink in until cheering from behind me started! Was such a phenomenal experience at this event!" Saturday evening began with the Aero group initially being treated to Tony's rum punch concoction savored over laughs and tales of the day's sailing followed by the host club providing a big dinner and libation spread at their lovely club facility with a beautiful sunset over the lake as the backdrop. Bedtime came early for all with tired bodies well oiled by the infamous rum punch! Sunday's breezes dawned initially light but began to build by race time albeit they were going through some major shifts. Race 3 had your writer finishing in first with Tony not far behind in second with Don and Darryl respectively coming in thereafter. Race 4 had more wind and your writer did a Marc Jacobi finishing a full leg ahead followed by Tony, Darryl then Don. Notwithstanding starting behind the Waves Gregory Popp lapped that entire fleet and finished well ahead of all the Waves. Race 5 saw a lightening breeze that resulted in a weather mark cluster for the Aeros. Yours truly was trading tacks with Tony on the beat and went for the lay line a little too early and slowed trying to pinch in to the mark. Darryl came in with some way but Tony came in over the top of both of us resulting in Darryl and Greg going into irons. Don slipped in around the mark and followed Tony who was speeding away with a huge lead. Darryl was first to extricate himself and got around followed by yours truly who had to sail away to get going and who had gone from leading to last. The reaching legs resulted in a hard chase for your writer first passing Darryl on the first reach then Don on the second reach. While Tony's lead was shrinking there was no overtaking him and he prevailed as the RC shortened course at one lap in the lessening breeze. And that was the finishing order for the final race. 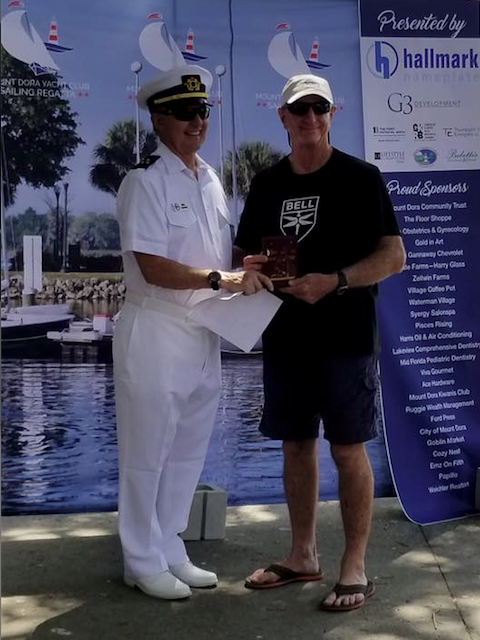 After sailing in the keen interest shown in the Aeros by the other sailors over the course of the Regatta continued including requests to add Mt Dora to the Aero Winter Series as well as a lot of interest in trial sailing the boat. There was expressed amazement at how the Aeros performed in the conditions. The Regatta concluded with the awards presentation and the typical Aero camaraderie as we assisted one another in packing up to head home. Tony, having a long drive north, departed early so Don stood in as his proxy for the trophy photo.